Wooden Table Top Easel. 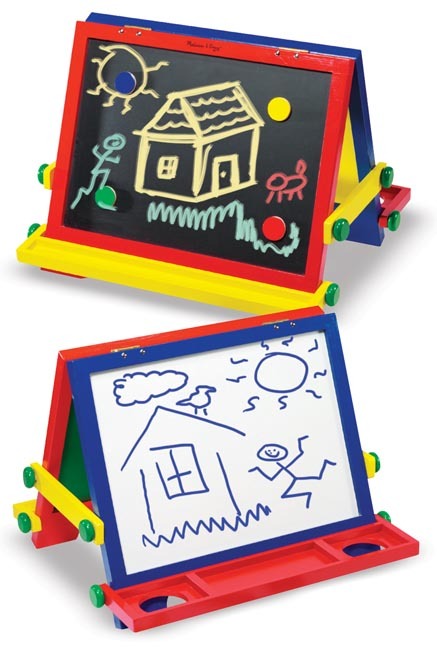 Convenient and compact, this tabletop easel includes chalk, a dry-erase marker, an eraser, magnetic chalk- and dry-erase boards, plus four magnets! Just add imagination! Provides an easy way for practicing vertical writing as recommended in Early Literacy for Young Catholics Activity Book. Dimensions: 20" x 15" x 15" Assembled. Recommended Ages: 3+ years. Contains small parts. Conforms to ASTM D-4236 (American Society for Testing and Materials).